Allerton Cat Rescue is a non-profit sanctuary for felines either abandoned, mistreated or otherwise between homes. All are looking for a warm, loving home and the means by which to live comfortably until they are brought to a family home. Brenda and her team of volunteers explore all avenues to raise funds, can you help or do you have any fundraising ideas? We have bag packing monthly and are in need of volunteers to help with this. Please see our events page for dates and contact us if you can help. Alternatively, just turn up on the day. We are always looking for items to sell here to raise funds , please consider us if you are having a clear out and get in touch, we need , Clothes, DVDs , CDs , Toys , Handbags, Bric a Brac, Jewellery, Console games. Other ideas for fundraising include sponsored event, dress down day, bake and cake sale at work. We can advertise the event for you and please get in touch if you need some posters designing which includes our logo. We have food bins in all Morrison’s franchises within the Bradford area if you would like to deposit food (Tins, Pouches, and Biscuits) for our Cats. All we ask is for a little help to ensure we can give the cats a loving place to live whilst they are looking for their forever homes. Donations can be made in person at our events or online via PayPal. Online donations can be one-off gifts or set up monthly. The amount being donated is set by you, so give as much or little as you can – every penny helps. Please consider buying an item for our cats and kittens, we need cat food, litter and any toys. Please see our Amazon Wish List if you can support us. We are always looking for volunteers, including fosterers, fundraisers. Please contact us if you are interested in supporting us. Please like and share our facebook page, if your are able download our donations poster and display it in your workplace or community to help our cats. Click here to view & Save the PDF. 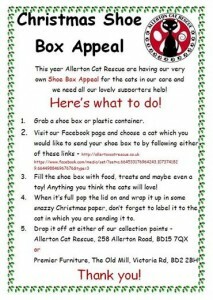 Perhaps yourself or your children would like to pick one of our cats to give a Christmas box to? Please print and share our poster amongst your friends and work colleagues. Lastly, we’d just like to thank all who have donated, and those who continue to donate – you all make such a huge different to the lives of every cat and kitten that comes through our rescue.